For the electrodes, I got good results by replacing the gel layers in medical electrodes (already used) with sponges soaked in warm saline water. In case you’d like to read more about creating your own EEG circuit, check out Solson’s EEG page. He’s got some neat info on his EEG hardware as well as on Neuro-feedback. ~ by teknomage on August 15, 2008.
i saw your EEG schematic online and it generated few questions in my mind. does your EEG circuit gives you specific wave(for e.g. alpha,gamma,delta etc.,)?or it is a combination of all the signals?i would also like to know about one of your circuit element,7805T(IC).i know it is IC but what it does and where did you get it from.i could not find 7805T anywhere. i will really appriciate your help.please respond to this as i might have further questions. I’ve been trying for months to get something like this working for neurofeedback. I know it should not take me months, but hey, I wouldn’t be trying to do neurofeedback if I could turn one round in a day or two. Anyway, glad I found another circuit. EKG was easy, the instrument amps I’ve tried (INA126 and INA129) both plugged straight into the PIC ADC. I used a body reference to amp for the INA126, and I’m using a TLC272 DRL with the INA129. I’m not convinced it’s much “better” than just using connecting a reference electrode, but I prefer having ONE differential reference and ONE DRL. My first question, what gain resistor did you use on your instrument amp? Secondly, why are the TLC272 marked as three individual parts if the TLC272 is dual? Or is that just a quirk of your schematic program? Also, to make two channels, you could tie X input pin on INA[a] to X input on INA[b]? So that you could have channel one, channel two, reference and DRL/VGND… a total of four electrodes? And finally, when I MultiSim the filter, (I want to squash 50hz), I don’t get a most ideal response… could I do the filtering digitally? Or is the signal liable to clip? Sorry if I’ve been a nuisance. I really would like to get this thing working so I can (fingers crossed) abate my need for ADHD medication. It looks like you have done a great job on the schematic! I’m having trouble reading the one on this website. Would it be possible to send me a larger image? did it give output ? is those component available ,can i buy it? Interesting EEG. Thanks for showing the details. I’m looking at mapping the EEG of a person using a bone stimulator to show how they work. Interesting! Do you have a webpage sharing your work on this bone stimulator? hi Mertin., your work is out of the ordinary and shall i need the exact output in measuremet of volts?? sir, i was designing an eeg sleep detector…my question is, how can i design an eeg circuit to define the alpha and theta frequency ?? You’ll have to either use very narrow filter bands to separately measure those frequency ranges… OR you could program your PIC to filter them for you… OR better yet, program the filters into your interface software. Sir why there is a need of TLE-2426, from the circuit operation point of view? What can we do if it is unavailable.? hi… i am a student of engineering from india. 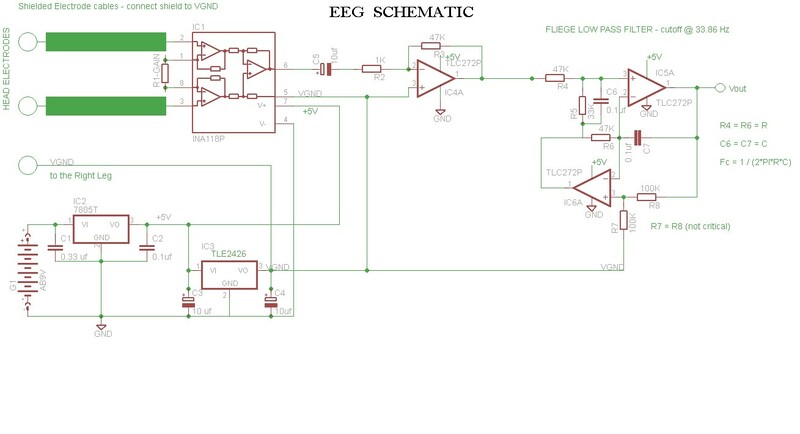 i have taken the designing of eeg as my project. can u send me the circuit diagram of eeg so that i can implement it in hardware??? Prateek, please use your brains and CLICK the schematic image on the blog’s main page!!! Thankyou sir…… is there any alternativve for TLE2426 ??? I am doing a final year project on “BRAIN MACHINE INTERFACE”. I found your circuit schematic very helpful, but I need the specifications of the electrodes. If you could guide me in selecting proper electrodes to analyza alpha, beta, delta & theta waves. teknomage if you are looking in on this page there is a Bob beck brain tuner page . I built this, works really well. hi… i m rajesh from B.E. (biomedical ) sir i have to interface 21 eeg signals to computer at a time so plz tel me about the interfacing..
hi, well first of all, you have a couple of things to consider… one is the EEG frontend and second is the actual digital interfacing to the PC. So, for 21 EEG signals, are you planning to build 21 separate EEG circuits for the frontend and then feed them to the microprocessor and then to the PC via the serial port or USB? This will be the more expensive option but it’ll make things simpler for interfacing later on… OR your other option is to build only ONE single EEG measuring circuit and then use a multiplexer to scan through all your 21 channels, and then feed it to the uP to be sent to your PC. For this, you will need to get a couple of high-precision, low DC offset analog multiplexer… Someone has already worked on a circuit like this, but I’ll have to search around for the link and post it here. If not, then you’ll have to figure out a way to minimize noise from the multiplexer as well as the required clock to drive it… Hope this helps for now. this is baji studying b.tech. i want to do a project “operating a computer with brain instructions”. can u plz tel me is this EEG schematic useful for me to give instructions to computer? hey i am sumukh from India i am doing a BCI project , and i am done with my hardware part and now i want know can i use eegprobe ,after getting the signals i want to process in matlab. please reply me. Sir,I want to design an equipment which shows the output of both EEG and ECT,for that how can i design an EEG preamplifier circuit?? I am a student in a university in technology and science. I need your help. about data? I extremly need to finish my work. Especially in amplier. I look forward your reply early. hello sir, i am searching a circuit for signal (movement related potential) from spine (between L3-S1). i want to ask that will this designed circuit work for spinal signal? Sure, it should work, you might need to experiment on your own to match the input impedances. Hello! I built this circuit for Ecg . Can I ask you some questions? From what I understand I can see the set of waves coming from the scalp … I could not add a filter / selector so that I can distinguish different types of wave? Also I ask you where I can find the scheme of an interface to connect to a PC via a serial or USB cable? But for ECG, if you’re not concerned about losing the ELF frequency components, then you can simply feed the output of the EEG circuit directly to your soundcard and use a DAW like Audition or Audacity to record your heartbeat. Since it’s stereo, you can record upto 2 channels at a time. You can then analyze the incoming data as sound even at the lowest sampling rate of 11025 Hz. You can also use a software called Win Oscilloscope to view the incoming ECG data via your soundcard. You have lots of possible options available to you nowadays. All the best to you! Hello Luca, a gain resistor of 330 ohms would set the INA’s gain to approx 150x. And sure, you could use TS272 as a dual opamp, although they’re not low-noise precision opamps like the TLC272, which are more suited to such bio-medical applications. As for the 1V DC offset you are seeing at the output, you’d have to be more specific… are you seeing this 1V from the INA118 differential output, or at the opamp outputs? If it’s the latter, then it’s somewhat fine because what you are seeing should be the DC biasing that is being employed from the TLE2426, although I’d say that offset should be closer to 2-2.5V instead of only 1 Volt. You need to check your circuit once again and make sure everything is in order. I am working towards implementing some sort of EEG design with the purpose of trying to find out what is happening in my head over time periods ranging up into several hours. I am aiming for at least 8 channels. (I’m not yet sure about if I want to go into training my self with feedback in anyway whatsoever and if I am only wanting to be able to observe brainwave patters in a way which allows me to pair segments of the plots to recollections of the time those where recorded then the design aught to be very much simpler). The raw signal entering the first amplifier will contain many frequencies including noise signals and 50/60Hz interference, from my research I find that I can use a combination of high-pass filter, low-pass filter and notch filter(for the 50/60Hz) to clean up what is picked up by the EEG channel so that what’s left is only all the relevant frequencies depicting what is going on inside of the brain, at that point all that’s left is to separate the frequencies and plot them in a suitable format for the users consumption or analysis. But given the power of PC’s today and software such as Matlab, wouldn’t it be much cheaper and easier to simply digitize the raw EEG signal with as much details as possible/feasible, transfer it to a PC and use Matlab(or other software) to clean up the now digital data and then analyse the signal content? At some level this all comes down to whether or not I actually need a real-time design, which would take me longer to achieve, cost me more money and be a lot harder to do. I would really appropriate your thoughts about what I have written about. Yes of course David, if you want to save time and cost on developing your 8-channel EEG, then software-based filters will do the trick. Honestly, there’s very little that digital filters cant do in comparison to analog filters, it’s got more to do with tradeoffs in the filter order versus other factors. But if you’re not too concerned about real-time filtering, then digital filters will work. The only disadvantage I see is that if the power-hum overcomes the EEG signal from each channel, then it is quite likely to saturate the limited sampling bit range. If you are using active electrodes with your EEG circuit, then you can actually eliminate a good deal of the power-mains ‘hum’ at 50/60 Hz (depending on where you’re located), as long as you match the instrumentation amplifiers for each channel precisely. Then, you can send your raw EEG data straight to an ADC or you could cheat by using an Arduino or Seed, transmit the data to your PC and then post-process the signal with your preferred DSP toolbox or language. Am sure you’re already familiar with higher-order filters, so implement a good low-pass filter from 1 to 45 hz or so, and a Notch filter at 50/60 Hz. All the best! This entry was posted on August 15, 2008 at 1:05 pm and is filed under EEG, Neuro electronics, neurofeedback.You can follow any responses to this entry through the RSS 2.0 feed.You can leave a response, or trackback from your own site. Previous: Why doncha PIC on someone yer own size!